David Liddle was warmly received by a large audience at the Cathedral on Wednesday the 15th. A pupil of such luminaries as David Sanger, Marie Duruflé, Daniel Roth, as well as a former student at Worcester and St John's College Cambridge - we were anticipating an informed and polished performance, and were not disappointed. David opened his programme with Bach's fugue on the Magnificat, BWV733. Played with just the right sort of Germanic registration and tidily articulated, a touch of firm pedal reed bringing the work to a satisfying conclusion. We then moved to less familiar territory. Feliks Nowowiejski, (born Wartenburg 1877) was a Polish composer/instrumentalist of considerable repute, and a professor at both Cracow and Poznan Conservatories. He wrote many works for organ including nine Symphonies, all in minor keys (Opus 45) and published in the 1920s. We heard Symphony No 3 in A minor "Lourdes". This tune will be well known to many as "Walsingham" and is the tune sung in procession at pilgrimage events at the shrine of our Lady. The tune appeared in various guises in each of the three movements Toccata, Recitativo/pastorale (Le Miracle), and Epilog, For my taste as a listener, this was the least involving work of the evening, just lacking that certain something which holds the attention. The programme continued with an attractive set of four pieces by Frederic Wood, based on a series of Northumberland "scenes", North Tynedale, Cilurnum, Allendale and Borcovicus. These pieces were preceded by a short spoken narrative setting the scene for their inspiration. This well written music is very much in the "Whitlock" mould, and David found a particularly attractive and colourful set of registrations to complement the Border Country feel of this music. David's own composition followed. A lush version of the Skye boat song (Opus10 no1). A relaxing and easy on the ear arrangement, which proved a popular choice at this point in the programme and prepared us for the dynamics of the final item still to come. Louis Vierne, onetime titulaire at Notre Dame Paris, and contemporary and pupil of Widor experienced a somewhat troubled and tormented personal life. He suffered impaired vision as a result of cataracts which medical treatment of the time failed to improve. To what extent this background influenced his compositions can only be conjecture but the intense chromaticisms of many of his pieces surely gives us an insight into the inner man. Vierne found the inspiration for "Les cloches de Hinkley" whilst staying with a friend at this Leicestershire town. Apparently he was just across the road from the Parish Church where he experienced English change ringing for possibly the first time! The cacophony of the bells is dramatically portrayed as the work unfolds. Following generous applause, and as an encore, David played the "Departure of the Queen of Sheba" by Paul Ayres - All in all an entertaining, and beautifully played recital. Congratulations on last night’s brilliant recital at Alexandra Palace. The programme was admirably varied and full of delights and surprises. I’d not heard the Sanger piece before, but its inspiration was clear, and, like a Monteverdi or Gabrieli instrumental fanfare, the music provided an elegant yet unpretentious aural preparation for the remainder of the musical menu. I particularly enjoyed the Bach chorale preludes – two of my favourites, if one were forced to choose! I’ve never before heard the second verse of ‘O Lamm Gottes’ with the chorale on a 4 foot pedal reed, but shall certainly be trying it that way myself, for it worked extremely well. As for the sound of those Choir flutes in ‘Von Gott will ich nicht lassen’ – they were simply ravishing. I’ve long felt that Rheinberger’s 14th Sonata is one of his best, and one of the few that I thoroughly enjoy hearing or playing in its entirety. It is free from the somewhat congested textures and over-bearingly serious demeanour that make some of his sonata movements rather heavy going. It was a pleasure, therefore, to hear that expansive opening movement so boldly and sympathetically presented. The Alec Rowley piece was previously unknown to me (and, I suspect, to most others present). I am, of course, familiar with the exquisite ‘Benedictus’, and have also encountered a Naxos CD recording of a Concerto in D for piano, strings and percussion, but neither of these prepared me for the exotic harmonies and textures of ‘The Four Winds’. Thank you for unearthing them – they certainly deserve to be heard more often, and shed a completely new light on a composer often dismissed as a light-weight non-entity. Hollins’s music is always as much delight for me as it clearly is for you, and your rendition of the deservedly popular ‘Song of Sunshine’ was notable for its insouciant grace and charm. ‘Sharounag’ is certainly a piece to be reckoned with. Although personally unfamiliar with any of the Armenian themes, I could sense quite clearly the Russo-Eastern European atmosphere, and enjoyed the intricate textural and melodic interweaving of the music. The on-screen presentation proved helpful in following the musical discourse, and I particularly relished the virtuoso pedal moments, those pedal sevenths, and the dramatic closing gesture! ‘Choral Dorien’ was amongst the first Alain pieces I learned (some 48 years ago! ), and has remained dear to me ever since. It was an elegant vehicle for exploring the lovely sounds of those 8-foot flue stops. The Finale from Widor 8 is such a splendid piece, and rounded off last night’s programme in spectacular and fitting fashion. I’m sure that everyone present was thrilled by it – including the Queen of Sheba, even though she had to make a speedy departure afterwards to catch the last barge home! Thank you for an inspiring and memorable concert. Your expertise in handling the instrument was impressive, and you made it into a musical chameleon: it was hard to believe, for example, that the Bach, the Rowley and the Hollins were being performed on the same instrument! 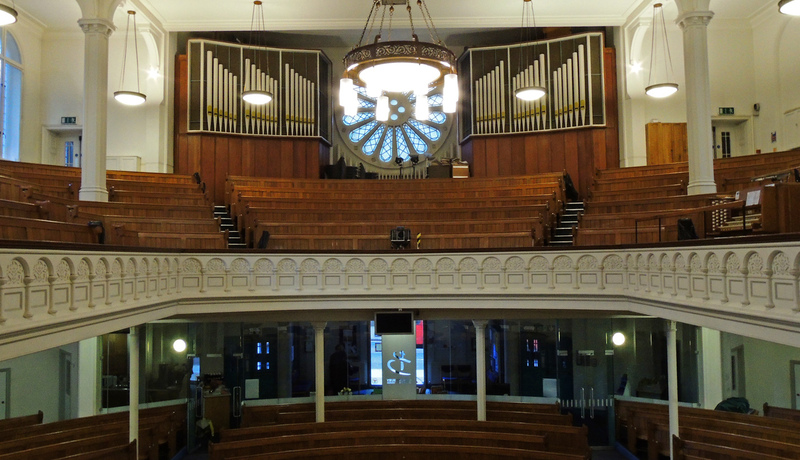 The recently restored organ at St Mary's Tottenham has become known as a fine example of a Hill organ which, having being out of use for many years, has remained in its original condition, including the retention of the Barker machine. It was a truly inspired notion to partner this organ with David Liddle for the AGM recital, particularly as we were made so welcome by Fr. Simon Morris and the parishioners. The programme was ingeniously organised, opening with a Brahms Prelude and Fugue with a Chorale Prelude on Herzlich thut mich verlangen, followed by a similar group by J S Bach. A jump was made to the twentieth century with a piece by the organist and finally there was a return to romanticism in three pieces by Reger, the last two being the well-known Toccata and Fugue in D minor. Virtuosity combined with warm colours characterised the Brahms Prelude and Fugue in G minor. The passagework in the Prelude was made vivid and exciting by the incisiveness of the articulation. 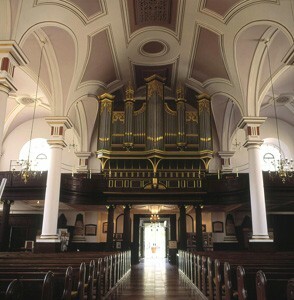 The quality of this organ was apparent in the way the individual lines of the counterpoint emerged so clearly. It was interesting to note how the typically Brahmsian two against three rhythms appeared at times warmly seductive and at others served to create a tension which amplified the intrinsic strength of the fugal form. The prelude on Herzlich thut mich verlangen provided an excellent foil to the fugue's feast of fugal complexity. The interpretational problem with this deceptively simple piece is that of balancing the steady heartbeat with the need for a rubato which is sensitive both to the chorale melody and the varying harmonic tension: this was all achieved with sensitive subtlety. For the Prelude and Fugue in G minor BWV 727 David surprised me by choosing a warm foundational tone on each of the three manuals to accommodate the passagework of the Prelude: for the Fugue Great and Swell choruses to Mixture served with admirable clarity, with the fine Trombone lifting the spirits at the end. Bach’s Prelude on Herzlich thut mich verlangen might appear at first sight to be a slight work but here we were made aware of the considerable emotional range contained within this miniature. David Liddle’s own Ballade no. 1 op. 2 is a most impressive piece. Its organic development of two intricately interwoven themes seems to progress in an apparently improvisatory manner which however reveals a finely wrought structure. The language is an original interpretation of that which prevailed in France in the mid-twentieth century and the impressionist colours were remarkably served by this organ: I remember particularly a clarinet appearing amidst gentle strings sounds and the wonderful tonal landscapes opening up towards the end. The three op. 59 pieces by Max Reger made a superb finish to the recital. Melodia had, as David observed, something of the Strauss Last Songs mingled with Reger’s individual style.